The sports psychology principles I have developed have helped my high school teams win 17 state titles—so far. The boys' and girls' high school tennis teams I have coached have had thirty-eight final four appearances and won seventeen state titles--and counting. The successes of these teams have come in part by the application of concepts and techniques I developed to systematically explore and improve the mental and emotional elements in my players' development. The origin of this work is grounded in my own experiences as a player. Back in the early 1970s through the mid-1980s, when I was a teenager and into my twenties, I played in many summer tennis tournaments at the Dwight Davis Tennis Center in Forest Park in St. Louis, Missouri. I used to practice so hard in preparation for these tournaments. But then, during the tournaments, I'd find myself getting in my own way more often than I'd like. I would get nervous and worry about the outcome before each match, and I knew it was because I was afraid of failure. I believe this fear of failure stemmed from my not being confident that I could win the match. 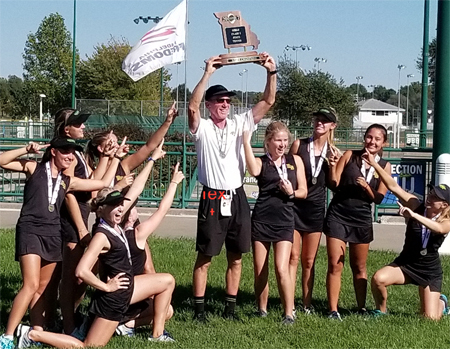 Ben Loeb has been the varsity tennis coach for the boys' and girls' teams at Rock Bridge High School in Columbia, Missouri for over 30 years. His teams have won more than 1000 dual matches, made 38 appearances in the final four of the state team championships, and won 17 state titles. Been also teaches a high school sports psychology class and has used the principles he has developed to help hundreds of players to overcome the mental and emotional challenges of playing winning competitive tennis. Ben's new book, Next-Level Coaching, outlines the principles he has developed over his career as a player and a championship coach to help overcome the mental and emotional challenges of playing and enjoying competitive tennis. It includes detailed self-assessment questionnaires and plans of action to help any player our coach use sports psychology to reach the next level. To Order Next-Level Coaching, Click Here!